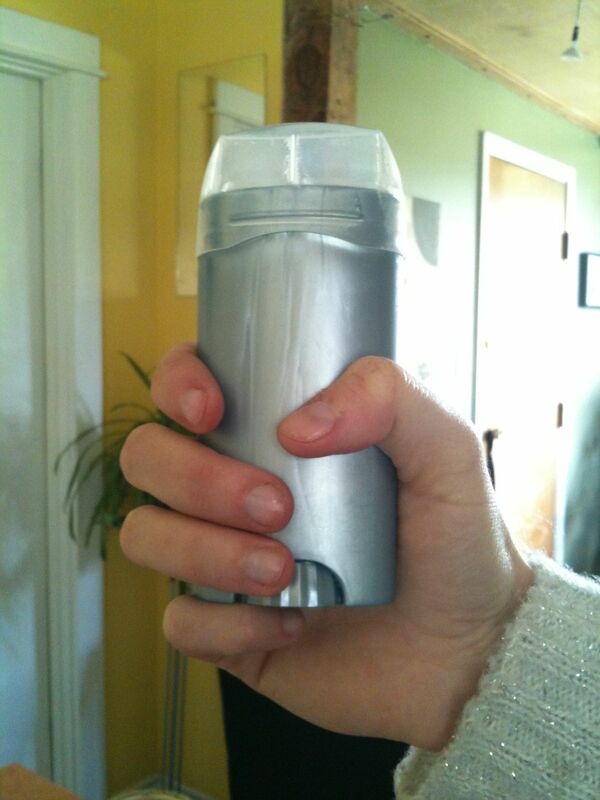 Anyhow, for deodorant I’ve actually had great luck with the crystal rock thing, but I discovered there’s a trick to it. You have to really get the thing wet and do a thorough slathering… like half way down your arm & chest and way beyond where you would normally put deodorant. Plus you have to wet it several times for each side and really use a lot. Apparently the stuff works by preventing the growth of the bacteria that cause the odor (sweat itself is odorless) so full coverage is really important. Plus, it works much better on shaved pits than furry ones. So once I figured it all out, it works great! If I ever feel the need for some “re-odorant” (as we call it here) I just use a little spray of rose water. For some time I have used cold-pressed (virgin) coconut oil as a body lotion, eye-make up remover and hair conditioner (on dry hair). Available in health food stores. It is great, and last for ages. It does melt in hot weather, so not good for travelling. I keep it in the fridge. There is a hair conditioner called Softee (which is primaraly coconut oil), which does not melt because it contains other products. I would not use it as an eye-make remover. On your suggestion I use sodium bicarbonate on its own, scooping it out of a jar and wiping it on. I’ve been using it for a month now and it works as well as commercial deodorant for me. I thought it might leave a powdery mark on clothes but I haven’t noticed it doing that. I reuse the bicarbonate that had finished its turn deodorizing my frig! We,re following your trip avidly hoping the extreme weather isn’t affecting you too badly. You are doing great work out there. Hey, I do the exact same thing (minus the peppermint oil). I’ve found it does turn into liquid when it’s really hot, but I didn’t have a problem with it leaking out of the container on a recent trip to a hot place. Hope you don’t either! I saw the Clean Bin movie recently in Dryden, it was very inspiring. Our family is already into reduce, reuse and recycle, but I am thinking now of other ways in which we can make a difference. I have decided to try the homemade deodorant and tooth paste (as well as the yogurt because I totally hate the packaging). I’d like to try making your version of the stick deodorant but am wondering how much of the coconut oil to add, do you have any specific measurements for the ingredients I could try. I don’t want to fail right off the get go. Update from the road – my deodorant definitely melted in the heat – it didn’t leak, but it got all over the lid of the stick bottle and it generally pretty messy. I’m thinking the powder would have been better for traveling. Tegan – aloe vera gel eh? Good one. I met a lady who used just vinegar and loved it. I’ve used plain ol’ aloe vera gel with peppermint and lavender essential oil for deodorant. Just like putting lotion on your armpits in the morning. I think peppermint essential oil is an unsung hero of underarm deodorizing! I’ve used other blends, and they just don’t cut the BO like minty freshness! As soon as I am done with my current deodorant, I’ll be reusing the container for this. Although I think I’ll skip on the peppermint, but I can’t think of what would be a good alternative either. Any suggestions? I have been buying deodorant from Lush, melting it, and pouring it in a stick. I line the stick with a bit of plastic from a milk jug, which I peel off after the bar cools. This allows it to slide freely. Hey – I just made the same deodorant yesterday!! I left out the essential oil because I think the coconut smells just gorgeous as is. I hope you haven’t had the leaks you were concerned about. I put mine in an empty toilet roll. I saw this somewhere on the web. I have no idea how this is going to pan out..fingers crossed. I’ve posted about it but it won’t publish until tomorrow. @ Natalie – as I said, I like the plain coconut smell, but if you wanted to add something maybe sandalwood (one of my faves) or you could go in and try some of the essential oil testers at a shop somewhere. Could be fun! I love it. I want to try this now! I think shaving legs and arm pits is kind of a strange practice on many levels. It took me a while to get over being self conscious about hairy pits, but I think it’s a much healthier way to go and certainly nicer for the environment. Why did we ever start doing that in the first place?? The answer to that might really make you want to quit!! I find that baking soda and water work just fine. I mix 1/8 tsp of water and 1/4 tsp baking soda, rub it on my armpits, and don’t rinse it off. Is that the method you tried that didn’t work? Perhaps you weren’t adding water and it doesn’t work unless you do? I’m surprised that baking soda didn’t work for you. Hmm, ya I wasn’t using water with the soda and cornstarch. Once I added the coconut oil, it worked great, but maybe it has more to do with the added moisture content than the oil itself. 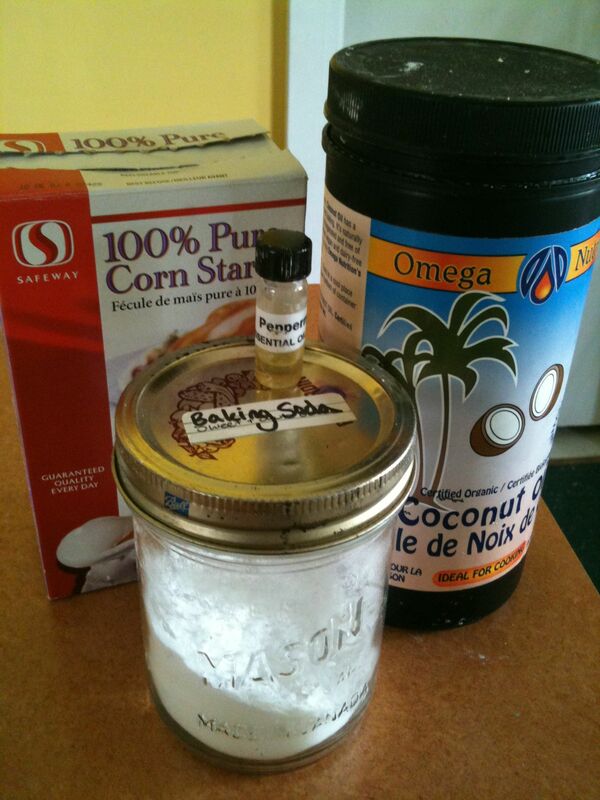 . .
currently i use 50/50 baking soda & cornstarch, with a perfume oil for it to adhere to. most days it works pretty good. My husband had an idea to spray the arm pits, feet ect. with 99% isopropyl alcohol, it kills the bacteria. I have been waiting to tell some like minded people about it, we’ve been using it for 2 years and it works like a charm. Just be sure that your body parts are freshly washed and that’s all there is to it, no stains on clothes, does not dry the skin out, and is perfectly safe. It lasts about 24 hours.We recycled a small sore throat spray bottle for easy application. I have been using homemade deodorant since sometime in 2010.. my first batch worked great at first.. but then turned for the worse. 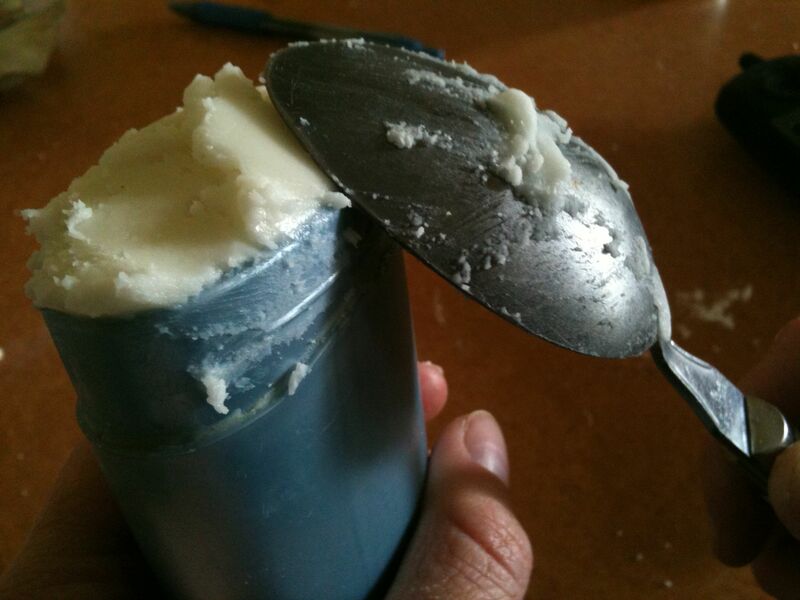 I had made a lotion based one with cornstarch and baking soda. However, I was not so strict about washing my hand before scooping it out. So I made what I thought was a months worth and two weeks in I got a bad irritation under both arms – it came on overnight, however that afternoon I had been feeling uncomfortable. So I learned that the germs on my hands we breading in my little jar. So I made a new batch and added TEA TREE OIL – it is a natural disinfection and bacteria killer! I also make sure now to wash my hands before I apply it. Now it is great! Ooh, good one. I never thought about hte bacteria on our hands. I hate hte smell of tea tree oil, but I do keep it around the house for its disinfecting properties. I just watched your doc last night and in 2 words…brilliant and brave! I can’t stand packaging and I’m always trying to be a consumer aware of that. We started buying raw milk from a local farm so have stopped the use of plastic and cardboard milk containers. We get it in a 1 gallon glass jar which is reused every week. Household cleaner is 20 drops each of tea tree (don’t like the smell much either!) and lavender oil in a recycled spray bottle filled with water. I use baking soda as an abraisive and deodorizer with this spray, like on tub, sink and toilets. I use a pure cocnut oil/gardenia oil for my skin and absolutely love it! I will try your deodorant idea with this and see how it goes since I’ve been looking for an alternative that actually works. Many good wishes to you in your endevours. I really think you are doing something huge to change the way we think about garbage and packaging. Thanks! Thanks for your kind words! I’ve given up on the teatree oil in my deodorant as it gave me a rash, but I still like the coconut oil/baking soda/corn starch combo. Looking for the perfect scent now. Where do you get milk in 1 gallon bottles? Ours are only 1 litre. Colloidal silver is awesome for deodorant, it doesn’t keep you dry, but it seems to kill the bacteria so you don’t have the odor. Just dab it on with a cottonball. It does take using it a while for it to work and is more expensive, but well worth it in my husbands opinion. Plus, it’s about the only thing that doesn’t give him a rash.